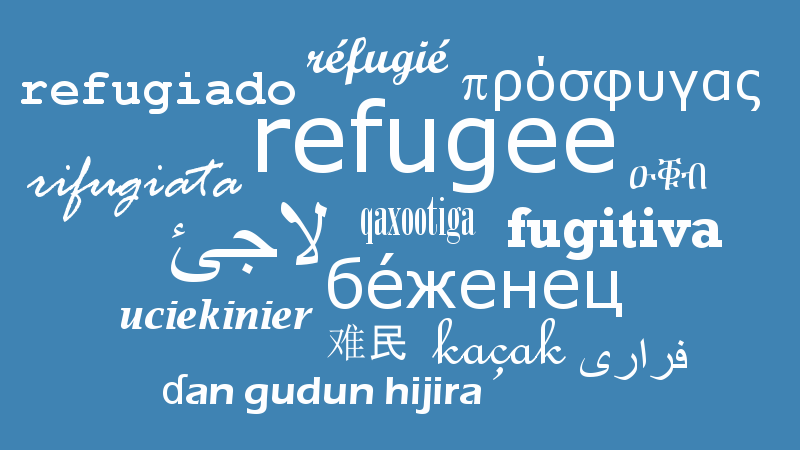 The word "refugee" in different languages. This website provides information in English. In some cases, resources are available in many other languages. For a comprehensive dossier, please visit our German language dossier on refugees. This guide offers first orientation to refugees arriving in Germany, it was financed and organised by volunteers to provide neutral information. Translated into many languages, e.g. English, Frrench, Arabic, Pashtu. Information for refugees who have newly arrived in Germany, covering aspects such as asylum seeking procedure, work permit, school and childcare, living and learning German. The website is hosted by Telekom AG and edited by volunteers. This article explains the terms asylum law, aliens act, immigration act and informs about the laws and regulations and fields of law that are relevant in this context. Another section deals with the question what is regulated by the asylum law. The information is offered by the professional association of law journalists. The Federal Office for Migration and Refugees is responsible for giving immigration advice to adult immigrants. It develops the relevant programmes and manages their practical implementation. The website offers a search option for advisory centres in specific regional areas. The Federal Office offers the new brochure to help immigrants and refugees understand just how vital the Basic Law  that is the German Constitution  is, and how it is lived out in everyday life using simple language. Part of the Federal Offices concept of initial orientation and value communication, which is in the process of being implemented. Explanatory films are to be published. This website is published by the Federal Ministry of Health, to guide asylum-seekers through healthcare provisions for refugees: topics range from a general introduction to the healthcare system and initial examinations to vouchers and e-cards, contagious diseases, vaccinations, special healthcare measures in place for pregnant women, children and adolescents. Leaflets for download in different languages: Brief information on child benefit for those entitled to claim political asylum and recognised refugees; information on child benefit for unaccompanied underage children entitled to claim political asylum and recognised refugees. For example, the information is available in Arabic . This online information for parents is one of three handouts that are available in eight languages, including Arabic . All material is accessible on the website of the ministry for education, youth, and sport in the state of Brandenburg . The competence centre for child daycare institutions in Saxony offers information for parents and staff to support children from non-German families. The fact sheet on multilingualism is available in 18 languages and gives first advice, it is accessible for download and can be handed out to parents. DJI Impulse Special English Edition 2014: Living and surviving- The problems faced by young refugees in Germany. How can our child learn 2 languages, German language and our own language? The State Institute of Early Childhood Research offers three information leaflets for parents in different languages, including one on language learning. University makes funds available for persecuted scholars -apply now! Given that scholars are persecuted in various countries around the world, the University of Göttingen is awarding short-term grants as well as tweelve-month fellowships to scholars - including PhD students. Details concerning the application procedure can be found on the website. Information about finding work in Germany, permission to work for foreign citizens,, recognition of qualifications, integration measures. The website "Study in Germany" published by the German Academic Exchange Service (DAAD) provides information about programmes for refugees. This information is provided by the Federal Office for Migration and Refugees, to inform about access to the labour market. Access to employment depends on residence status (residence permit, permission to reside).